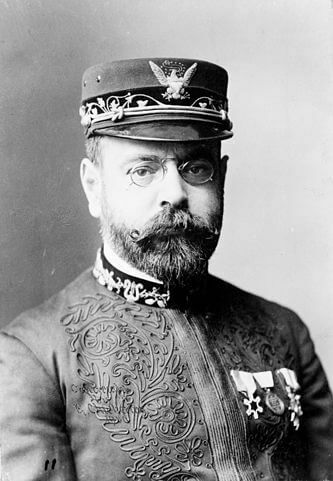 John Philip Sousa (1854 - 1932) was an American composer and conductor, best known for heading the U.S. Marine Corps. Band, "The President's Own Band" under five presidents, and for composing patriotic marching songs including Stars and Stripes Forever , Semper Fidelis , and The Liberty Bell . In 1976, he was inducted into the Great Americans Hall of Fame. In 1987, Congress designated Stars and Stripes Forever as the country's national march. Sousa was born in Washington, DC, the third of ten children of Hessian, Portuguese and Spanish ancestry. Sousa studied voice, violin, piano, flute, cornet, baritone horn, trombone, and alto horn and had perfect pitch. His father, a trombonist in the Marine Band, enlisted young Sousa in the Marines as a musical apprentice in 1868 when he was just 13, officially with the rank: "Boy." He left the Marine Corps. at the age of 20, and re-enlisted five years later from 1880-1892, serving as leader of the Marine Band, during which time it became the premier military band in the country. He became famous after two tours and 60 recordings of the band's marches were released. He received a discharge in 1892 to pursue a private career as a band leader, then returned to military service, this time with the U.S. Naval Reserve at the beginning of World War I. After the War, he returned to leading his own band, but continued to wear his Naval uniform (pictured at right). He received the World War I Victory Medal. Sousa's marches continue to instill the spirit of patriotism and remembrance for the soldiers who served America.